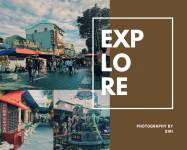 ⭐️Anping is full of small streets and alleyways that are packed with vendors, eateries, shops and gaming stores. However, the old buildings have not yet been exploited yet, which allows visitors to discover the unseen beauties and learn the stories behind these preserved buildings and streets. Take bus no. 2, 88 or 99 to Fort Anping stop (安平古堡站).